With Somali pirates in the news, naval historian Peter Earle takes a timely look at how the Royal Navy dealt with pirates in their 17th century heyday. Piracy and its suppression are much discussed these days, but few writers bother to investigate how piracy was dealt with in the past. It was not easy and it took about a century, from the 1620s to 1730, to eradicate piracy from the western world (with a short reprise from 1815 to 1830). The pirates of this period can be divided into two groups, the individualist rovers who are the heroes of our childhoods, and the Barbary Corsairs who operated from bases inAlgiers,Tunis,Tripoli, and Sallee inMorocco. These Muslim pirates, who attacked Christian shipping and enslaved the captured passengers and crews, were much more dangerous than famous rascals like Blackbeard. Serious attempts to control the Barbary Corsairs began in the 1620s, when they were at their strongest. Algiers alone had over 100 sailing ships and six galleys. The fleets of Tunis, Tripoli, and Sallee were much smaller, but still formidable, with fast, well-armed vessels manned by fanatical crews. The navies of the Christian states at this date were relatively small and weak. Most of their ships were big and clumsy and not really suitable for chasing their much faster Muslim opponents. ‘It is almost incredible to relate in how short a time those ships out-sailed the whole fleet out of sight,’ wrote Admiral Mansell after giving chase to Algerian pirates in 1620. There were therefore few successes in the first half of the 17th century. The corsairs continued to take many prizes, both at sea and on land. Raids ashore fromItaly toIceland garnered large numbers of captives to be enslaved or offered for ransom. Ransom enabled the wealthier captives to get home eventually, but the fate of most poor captives was a lifetime of slavery. The 1650s saw a huge increase in the navies of England,Holland, andFrance, including many small, fast, shallow-draught ships, often propelled by oars as well as sails. Such vessels, usually known as frigates, were ideal for fighting the Barbary Corsairs. Sixty years after Admiral Mansell, Admiral Herbert was able to write that ‘they [the corsairs] find it hard to escape any of our frigates’. The other important innovation of the 1650s was the development of convoy to protect merchant ships from pirates. By the 1680s, naval ships regularly convoyed merchantmen on the major shipping routes. Few corsairs would dare attack a large convoy. Defeating the corsairs still took a long time and was very expensive. A political will to spend money was essential.England and France were the main combatants. Each of them engaged in several fiercely fought wars against the corsair states from the 1650s onwards. Both sides lost ships, but the corsairs, now far weaker than their Christian opponents, could less afford to lose ships and men. Cumulative defeats gradually wore them down and, by the 1680s, they felt compelled to sign a series of treaties exempting ships of the victorious European powers from attack. Documents known as ‘Mediterranean passes’ allowed the ships ofFranceandEnglandto sail unharmed by the corsairs. The ships of the weaker European nations (and, after 1783, of theUnited States), however, remained vulnerable to attack. These countries could choose to fight the corsairs, pay them protection money or take a chance and sail into danger. Most agreed to pay protection money or tribute, and this reduced the numbers of both corsairs and victims. But there were still corsairs active as late as the 1820s, and the problem only finally ended with the French conquest ofAlgiersin 1830. This example soon inducedTripoliandTunisto end all acts of hostility against European nations and to restore to liberty their few remaining slaves. The Barbary Corsairs operated mainly in the Mediterranean and in the waters of Western Europe, leaving the rest of the world free for individualist pirates, who, by the 1660s, were to be found mainly in the Caribbean, the coastal waters of North America, and later around the Atlantic islands, off the West African coast, and in the Indian Ocean. These pirates, though better known in modern times, never achieved the numbers and importance of the Barbary Corsairs. Numbers varied during ‘the golden age of piracy’ (c. 1660-1725), but they rarely exceeded 2,000 men in some 20 or 30 ships. The vessels were usually converted prizes and were similar to the ships of the Barbary Corsairs – fast, shallow-draught, and usually fitted with oars as well as sails. The European maritime powers recognised a duty to protect their own coasts from pirates, but had an ambivalent attitude to the growth of piracy in West Indian waters. Such piracy might be seen as bad in theory but useful in practice, a cheap or costless way of expanding the country’s economic and naval power. England and France adopted a policy of piratical imperialism, condoning or even actively supporting piracy committed by their own subjects, since this was mainly directed against the Spaniards, who monopolised Caribbean trade. Destruction or capture of Spanish ships by pirates opened up this trade to the English, French, and Dutch, and these nations soon dominated the carrying trade of the area. With the Spanish monopoly broken, piracy was now seen as a hindrance to the further development of trade, so that by the 1690s piracy was universally condemned by Western European governments. 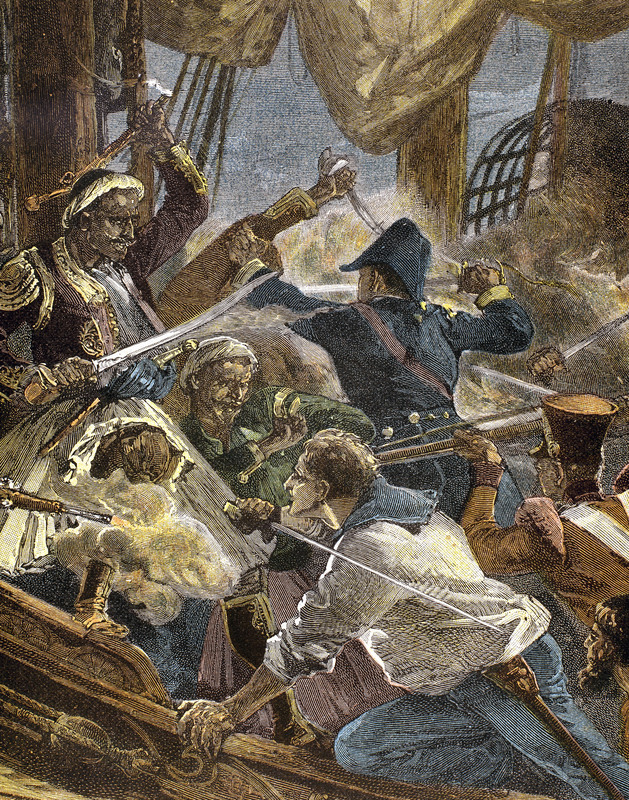 The pirates had become the ‘enemies of mankind’ – to be treated like vermin and destroyed or driven from the seas. Achievement lagged behind rhetoric, however, for governments lacked the will to spend serious money on the eradication of piracy and also the knowledge of how to go about it. Even so, they laid a base for later, successful anti-pirate campaigns. Piracy depends on safe havens, and these were plentiful in the late 17th century, as attracting pirates was good business, one in which profits could be made in fitting out ships, buying and selling prizes, and providing bars and brothels in which crews could spend their prize money. Installing anti-pirate governments in such places took a long time, but it was eventually achieved, mainly by choosing the right man for the post of governor, having dismissed venal or incompetent predecessors. Jamaica, the most notorious of the pirate havens in the 1660s, was to become the centre of British anti-piracy activity by the 1690s, while evenSouth Carolina, the last important pirate haven in the British mainland colonies, was fairly law-abiding by 1720. Havens still existed, places like the Danish island of St Thomasor, for a few years, the Bahamas, but such bases were far fewer in 1720 than in 1680. The eradication of piracy required revisions to the law. Only in the Spanish colonies was the law a serious impediment to pirates, with those captured likely to be condemned to the galleys for life or executed, while naval commanders could and did hang captured pirates from their yardarms. Such arbitrary justice was rarely employed by the British, whose laws required captured pirates to be tried and found guilty by a jury, something difficult to achieve. Witnesses were hard to find since most were sailors who had long since departed, while those still present were generally reluctant to give evidence. And getting a jury to give a guilty verdict was near impossible, since many pirates were local men, protected by friends or those who profited from their piracy. 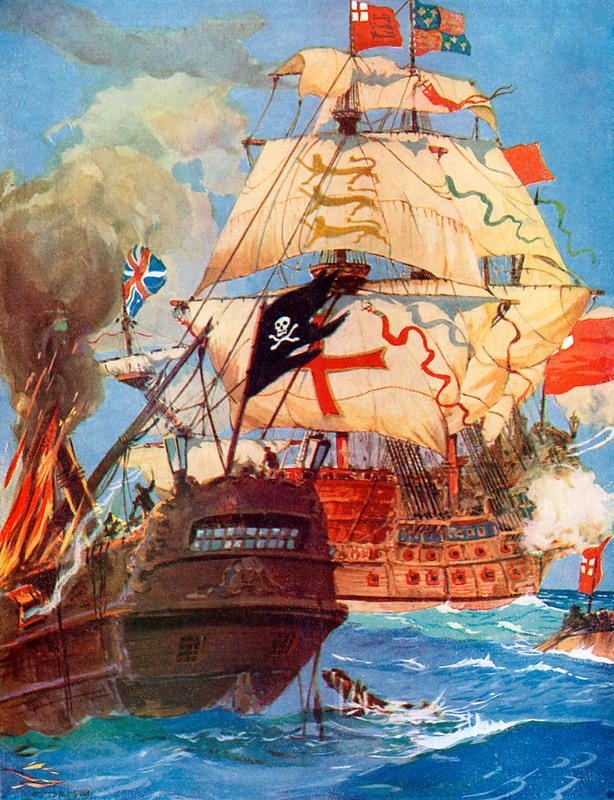 In 1700, Britainenacted a new law which would prove to be the doom of pirates. From now on, a small court of colonial officials or naval officers (and no jury) could assemble anywhere to try pirates. Proceedings became heavily weighted against defendants. Naval officers who made the actual capture often gave evidence, and members of the pirate crews were persuaded to give evidence against their shipmates in return for a pardon. The scene was set for a major campaign against the pirates. But first, as on many occasions in earlier years, a much cheaper method of reducing pirate numbers was tried. This was to offer pardons to all who surrendered before a given date. Pirates were rightly suspicious of pardons, since not all who came in were treated honourably, but there were always some glad of the opportunity to bring their loot ashore and live a quieter life – though for many the pardon was simply a brief holiday before going once again ‘to their former vile course of life’. The benefits of pardon exhausted, the government now set in motion two naval campaigns, one from 1699 to 1702, the other from 1715 to 1725. The British government was finally taking the problem of piracy seriously. The number of royal ships committed increased from just three or four in theWest Indiesand none in North American waters in the 1670s to a maximum of 24 ships employing 3,500 men in 1700 – more men, in fact, than there were pirates. Jamaica served as headquarters, with six ships, and the rest were stationed in other islands and in the mainland colonies. Naval orders stated that pirate ships were to be hunted down and destroyed and local colonial trade protected from pirate attack. 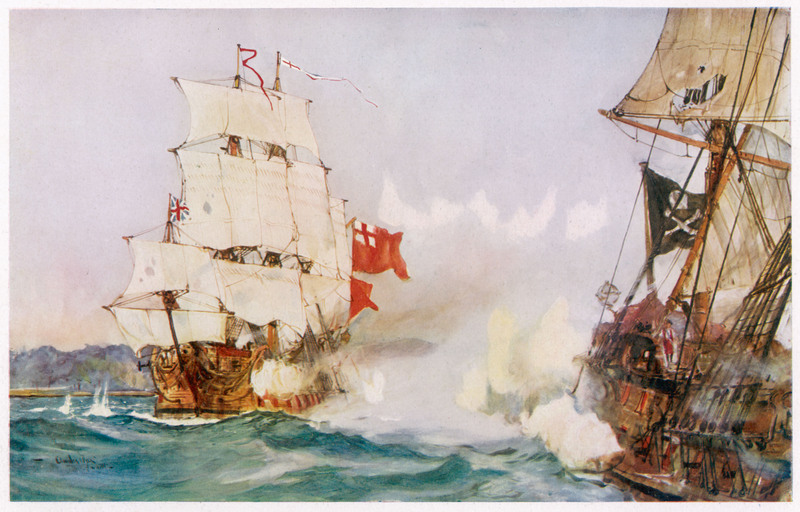 To read the rest of this article and find out how the Navy managed to clear the seas of pirates, pick up a copy of the May issue of Military History Monthly. One major reason was that the British seriously took up Jamaica and hanged pirates there. Another reason was the shallow waters near Nassau, some are 7-10 feet, way to shallow for the larger war ships to get close. Pirates could lure inexperienced captains to run aground there. Interesting that the Barbary Corsairs have been virtually airbrushed out of all modern discussions about slavery and about scrutiny of particular religions. I wonder why?